Once upon a time I woke up with an idea for a display. A huge flow chart that took up an entire wall, and asked readers questions about their reading preferences. As they worked their way down the chart, they would have to decide for themselves what kind of book they wanted to read, and eventually would find themselves at an envelope with a booklist. This week I was able to make that display a reality at The Cambridge Idea Exchange! I love reader’s advisory tools that ask the users to make decisions for themselves about what they want to read. Not only does it help them find a great new book, but it helps them figure out what they like, and why they like it. Maybe there’s someone out there who thinks they will only ever love fantasy novels – they jumped on the Harry Potter train early and they don’t see any reason to get off. Maybe after asking themselves some questions about why they like what they like, they’ll realize that what they really love is emotional character-driven story lines with dark plot twists and moral undertones. A whole new world of books is open to them. Similar to my YA personality test, this display is passive (doesn’t require staff supervision), yet still very interactive for the patron. Something extra I decided to add was a “Personalized Book Suggestions” form on the back of each booklist. I also set up an online form, and posted a QR code on the display. I see this as a trial version of a service I would like to expand. Also, attaching related images to each envelope was a last minute decision after a brainstorming session with a coworker, and I’m so glad I did it! They really make the chart pop. If you decide to use my resources, or make your own flow chart, let me know and send a photo! What other passive but interactive reader’s advisory displays have you tried? *Edit: Since this post I’ve created 2 new Flow Chart Displays: Try a New Type of Book and Meet Your Next Literary BFF. I love to hear about other libraries adapting these resources. Three librarians from the States have done a beautiful job incorporating the Flow Chart display into their spaces. Young Adult Librarian, Bonnie Svitavsky added the flow chart to a large, horizontal space in the Puyallup Public Library (WA) Teen Zone. I love how it looks webbed out in different directions, and the addition of cat photos to the envelopes. Librarian Chrissy Lewin tweaked the lists to fit her collection at a Cooperative Arts and Humanities High School in New Haven, CT. Thanks for sharing, looks great! 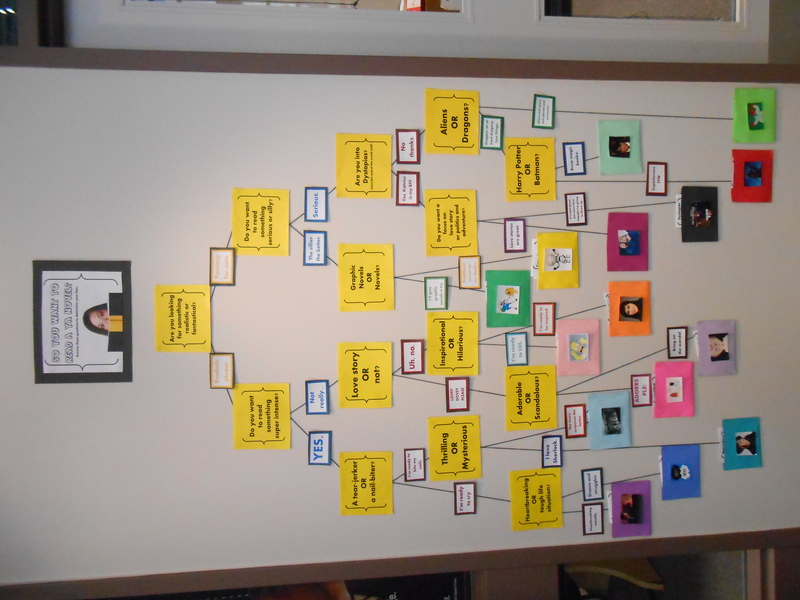 Josh Caudill‏ from Metro Library adapted the flow chart into a 3D display! I love how the reader is lead directly to a book instead of a book list. Wow! I love so many of these ideas and signs! Thank you for sharing!